After a multi-year effort involving conservation groups, agencies, tribes, private landowners and other stakeholders, the California Department of Fish and Wildlife (CDFW) has completed the 2015 State Wildlife Action Plan (SWAP) Update. The action plan is now under review by the U.S. Fish and Wildlife Service and should receive final approval in February 2016. The action plan identifies and prioritizes at-risk species and habitats, and provides conservation strategies to help protect and conserve these species. The plan is not a regulatory document. Rather, it is meant to build consensus and collaboration by identifying best management practices for conserving the state’s most vulnerable wildlife species. Once the action plan is approved, it will open up millions of dollars in federal grant funding for programs that benefit at-risk species such as the Sierra Nevada bighorn sheep, coho salmon and others. As mandated by the U.S. 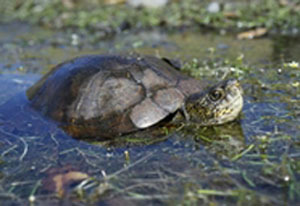 Fish and Wildlife Service, CDFW revises the State Wildlife Action Plan every 10 years. The action plan focuses on a regional approach to conservation, one that takes into consideration the complexity inherent to every unique ecosystem. In addition to the conservation strategies addressed for each ecosystem, the plan also contains companion plans to address key overarching issues such as agriculture, energy development, land-use planning and water management. In a separate but related action, CDFW and the Bureau of Land Management (BLM) today signed an agreement highlighting the use of innovative wildlife conservation tools on public lands managed by the BLM in California. These tools provide for actions on public lands that improve wildlife habitat conditions and better align California and federal conservation goals. The agreement recognizes that the 15 million acres of BLM lands in California are critically important for sensitive species. The agencies have agreed to cooperatively identify public lands where more lasting wildlife conservation would meet mutual goals. As such, the agreement will accelerate and facilitate delivery of conservation efforts highlighted in the State Wildlife Action Plan and at the same time provide for addressing threats and stressors in a targeted way. California is home to 197 mammal species, 433 species of birds, 84 reptiles, 67 species of freshwater fish and 5,047 native plants. It has more species than any other state. However, population growth, increased development, water management conflicts, invasive species and climate change are putting tremendous stress on these natural resources.